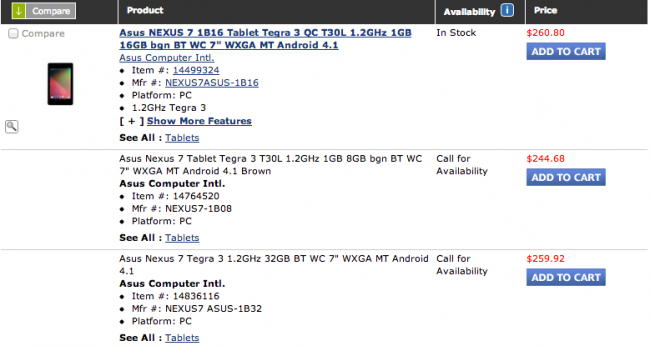 Yesterday, we showed you a screenshot from a Carphone Warehouse store that listed out a 32GB version of the Nexus 7, giving the world hope that Google was preparing another model of their popular Android tablet. Today, one of our readers noticed that in a purchasing system of theirs, that a 32GB version of the Nexus 7 was also listed, prompting them to call their reseller to find out more details. As you can see, the price from resellers is listed as $259.92, but that doesn’t necessarily mean that it will retail for $300 or higher should Google sell it. Because if you look at the price for the 8GB model, it sits way above its Google Play price of $199. So don’t take the pricing here as gospel. In fact, ignore it. What our guy was able to find out, is that his reseller is expecting to receive shipments of the 32GB Nexus 7 some time around October 24 and that this is a “special model.” It’s anyone’s guess as to what that means. The good news is that this is a second sighting in as many days. Thursday Poll: How Many Android Apps Have You Paid For?